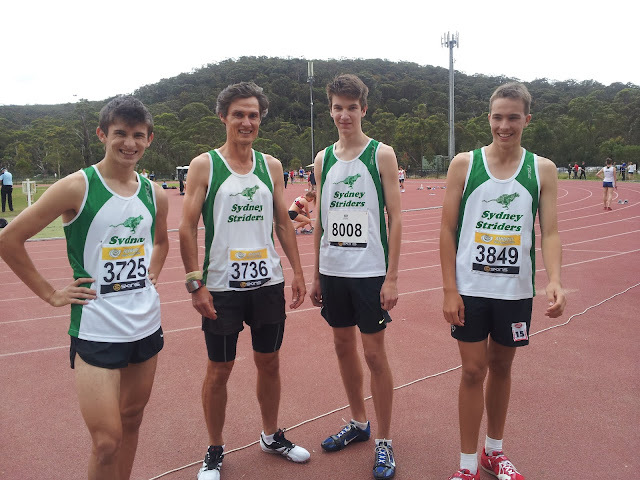 Nov 3rd 2012 Club Premiership at Narabeen and Campbelltown. It being close to home, I popped along to Narabeen to watch and ensure a 100m relay happened (having run the Striders 10K at Lane Cove in the morning, as did Hannah Gibson and Emma McGlinn). 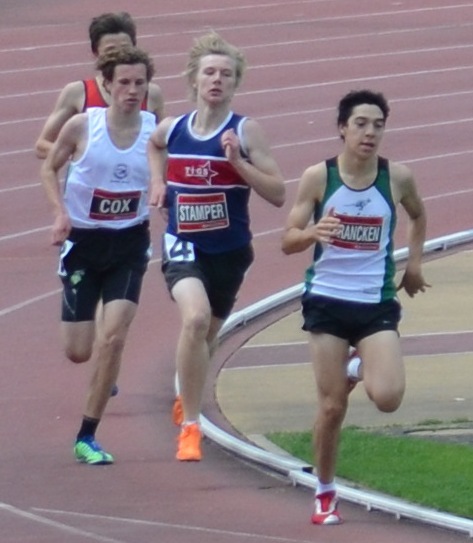 In the 100m Bethany ran 13:90, Ben Carter 14:30 and brother Tom 13:09. In the 400m, Tessa ran 1:03:78, Ben C. 1:02:24, Tom C. 58:82 and Gabe Corke a blistering 52:78. 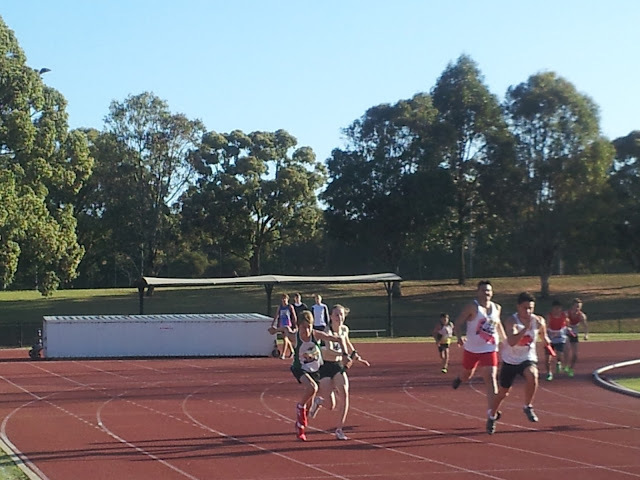 In the 1500m Amelia ran 5:14, Bethany 5:26, Joe Burgess 4:24 and Jason (the older bloke in the relay) ran 4:40. I don't think any juniors went to Campbelltown. So.... well done one and all! October27th 2012 Club Premiership at Bankstown and Illawong. Caroline, the Fat Controller, wasting too much energy clearing the steeple by at least a foot. Thye old and young face the challenge of the water jump together!! Bethany on leg 1 hands over to brother Adam for leg 2. As you can see, Striders are doing well at this point! 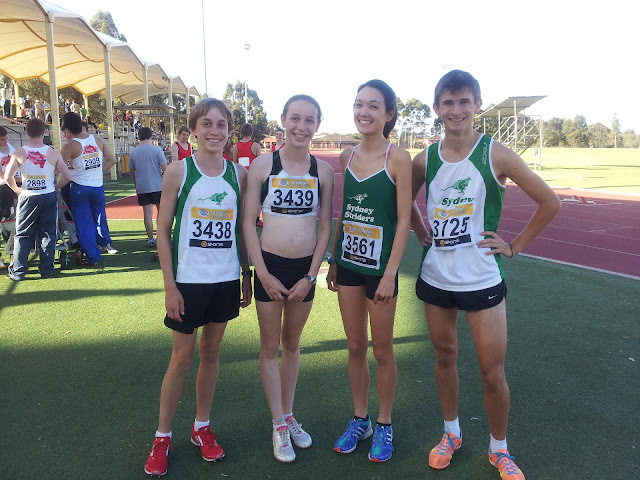 Kombat All Schools state championships were held over the 4 day period 11 - 14 Oct.
Hannah Gibson wins the girls 16 years Steeplechase at All schools! Ben Carter in flight. 2nd in the 12 years boys 80m hurdles. Ben on the podium with his silver state medal.